Vodafone Arena in Suva was host to the 2016 Fiji Sports Awards held on Friday 17th February; 64 athletes from 17 sporting associations were nominated, with 11 awards up for grabs on the night. Mere Roden, flag bearer for Fiji at the 2016 Rio Paralympics and Pacific Games gold medallist can add another accolade to her collection. 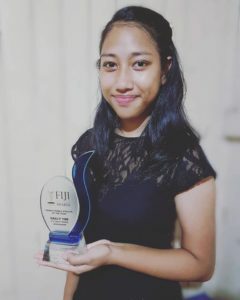 Roden won the Sportswoman of the Year award at the 2016 Fiji Sports Awards night, a category which included both able-bodied athletes and athletes with disabilities. The Paralympian has been playing table tennis for just over two years and her dedication to the sport epitomises the success of the Smash Down Barriers programme; an initiative promoting table tennis to people with disabilities as part of an Australian Aid’s Pacific Sports Partnerships programme delivered by Table Tennis Australia and the Oceania Table Tennis Federation. Active not only as an athlete but also in the role of President of the Spinal Injury Association of Fiji, Roden is a perfect ambassador for table tennis and its promotion as an inclusive sport. In the youth categories, Sally Yee took home the prize for Young Female Athlete of the Year. The 15 year old represented Fiji at the 2016 Rio Olympic Games, the first Fijian ever to qualify in table tennis. The award is a capstone to a remarkable year and the perfect springboard heading in to 2017 as Sally travels to Tokyo in just over a weeks time to train at the Ajinomoto National Training Center and participate in the Tokyo Open. This is part of an effort from the Japanese Olympic Committee and the Japanese Government via the Japan Sport Council to provide Fijian athletes with high performance training. Prime Minister Voreqe Bainimarama attended the awards night with Osea Kolinisau, captain of the Fiji rugby sevens team and Rio Olympic gold medalist, the guest speaker for the evening.